Caroline Kwambai beat Catherine Kirui's old course record by 30 seconds, with Hellen Kimutai pushing her all the way to the finish. Simone Staicu, in third, confirmed her racing comeback after having given birth six months previously. Wet weather had been predicted and a rising river could have altered the course, but the race began under a cloudless blue sky at a near perfect 12°C. At one point it seemed that the men were also on record pace, but in the end the wind thwarted them. For the first time the race included a 4-person corporate relay. Roughly 100 teams, representing about 50 companies and institutions, took part. The Ceská pošta team won with a time of 1:16:58. Many runners commented on the challenging course but they also noted the enthusiastic support of the crowds all along the route. Paul Kosgei broke the course record by 44 seconds and fell only 12 seconds short of Haile Gebrselassie's performance in Tempe (USA) on 15 January, which is awaiting ratification as a world record for the distance. In the women's race the first two broke the course record, with three-time World short-course cross country champion Edith Masai finishing 100m ahead of Deena Kastor. The old course record stood to Joyce Chepchumba, at 1:08:22. Masai's time is the fastest of the year, and both women set personal bests. Conditions were good - 15°C and no hint of the forecasted showers - for the record entry of 20,419 runners that gathered at the start on the Unter den Linden. Albert Kirui paced the field through 5km in 14:17 and 9km in 25:29, but hung on to eventually place a creditable sixth. Evans Cheruiyot led through 10km in 28:19 and 15km in 42:12 - a schedule well inside Fabian Roncero's 2001 course record of 59:52. Kosgei was mainly content to shadow Cheruiyot. He made two brief efforts but waited until 18km to launch his definitive attack. He went away to win by 130m, while Cheruiyot chased him home to improve his personal best by 45 seconds. Masai and Kastor started with identical personal bests, of 1:07:53, although Kastor's marathon time is six minutes faster than Masai's. After 45 minutes on the clock and several changes in the lead Masai determined to move. "I pushed ahead and kept pushing, and found I was going away," she said. 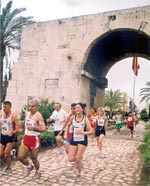 The half marathon is staged in a city that is 7000 years old. The organisers are the Berdan Textile Co. which employs 1100 people in Tarsus, in co-operation with the municipal authorities. The weather was good for running, and new records were set in both men's and women's races. In all, 608 men and 65 women ran, including 46 foreign runners from 11 countries. 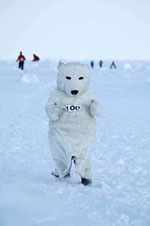 The world's coolest marathon took place at a temporary Russian polar camp in the high Arctic Ocean, hard by the Geographic North Pole. Despite challenging underfoot conditions of soft snow and hillocks of ice, as well as temperatures that dipped to -23°C, every one of the 54 competitors (43 men and 11 women) completed the course. The record field resulted from the cancellation of last year's event because of an international dispute over ice safety rescue teams. This was a factor beyond the competence of the race organisers, who simply had to bow to the inevitable. This year's race included most of the disappointed entrants from 2005. 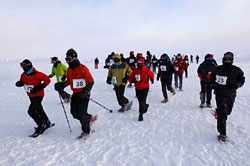 This amazing race is run on the ice floes that overlie the 3650m-deep Arctic Ocean. The ice is continually shifting, but using a lap measured by GPS methods allows a high level of confidence in the accuracy of the distance covered, even though it cannot be certified by conventional methods that apply to sealed road surfaces (several worlds away from the scene competitors confront at the top of the globe). Runners were a varied lot. Some were seeking to join a notional "Grand Slam" club of those individuals who have completed marathons on the seven continents and at the North Pole. Others were making their marathon debut—in the most arduous of conditions imaginable. 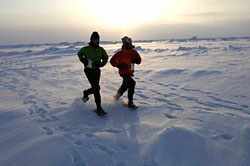 For some, the motivating factor was to raise funds for charity against the background of the unique challenge posed by a run at the North Pole. Hundreds of thousands of euros, pounds and dollars (both US and CDN) were raised on the backs of the participants. In the men's race Michael Collins and Carsten Kolle forced the pace—as far as anyone can force anything in this humbling environment. They crunched their way through eerily hushed surroundings; each must have been unduly conscious of the others' breathing, because there was nothing much else to which they could listen. They matched each other stride for stride over the first 10km. Then an alarm sounded: a polar bear was spotted. It proved to be one of the other competitors donning a costume, but armed guards who protect the competitors (always within range of a rifle shot) take these things seriously. Meanwhile, Collins pressed on. He dropped Kolle and went on to win by more than 30 minutes. Kolle paid for his early efforts as Marcel Kasumovich overhauled him to take second place. Alison Hamlett, despite this race being held over the toughest ever polar terrain, beat all previous women's polar times and overcame the challenge of the Antarctic Ice Marathon winner, Wendy McKinnon. She finished in sixth place overall. On a bright cool morning ideal for running no less than nine of the first eleven men set personal bests (three of these were debut marks) along with two of the top three women. Behind them, a record 36,500 runners enjoyed the celebratory atmosphere of this 30th anniversary race, and 1500 of them finished in under three hours. From the downhill start from the Arc de Triomphe a large group sped through the centre of Paris, passing 5km in 14:53. After a tour of the Bois de Vincennes at the eastern end of the course the pace had dropped at halfway (1:04:07). All the way along the Seine Embankment, from 25-33km the group dwindled in number. After passing through 35km at the Parc des Princes rugby ground in 1:46:27, Gashaw Malese made his move on a slight uphill. Through the final kilometres in the Bois de Boulogne he built up a convincing lead, and entered the Avenue Foch 250m finishing straight with only the clock as an adversary. He strove to duck under 2:08, to no avail. In the women's race Mihaela Botezan made the early running, passing 10km in 34:26 and halfway in 1:13:00 - to lead by a minute. She got to 30km in 1:44:25, but was now being chased hard by the Russian pair of Irina Timofeyeva and Natalya Volgina. They passed her at 35km and Pamela Chepchumba also overtook her before the finish line. Although Volgina improved her personal best by almost 10 minutes, it was Timofeyeva who finished stronger, pulling away to a 10-second winning margin. 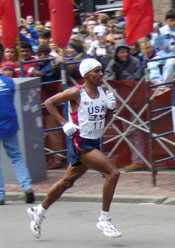 Sammy Korir, second fastest ever marathon runner, at last approached the form he showed in 2003 by surging to a convincing win in a world-leading time for 2006. Behind him two others went sub-2:07 and a 10 ran sub-2:11, doing much to re-establish Rotterdam's credentials as one of the world's fastest courses. Careful pacing took a group of 21 runners through 15km in 45:01. By halfway the same pace (1:03:22) had thinned the group down to nine. Pacemaking finished at 25km but 30km was reached in 1:30:00 at which point Korir started to push. He reduced the group to four as Charles Kibiwott, Paul Kirui and Dejene Birhanu tailed him. Birhanu dropped off as Korir edged the pace up, passing 40km in 1:59:55. At that point he started to get away: Kibiwott chased him, but tired and was overtaken by Kirui for second place. Four women went through halfway in 1:13:25, but then Viktoria Klimina fell back to leave Mindaye Gishu, Helena Javornik and the former world record holder Tegla Loroupe. Loroupe dropped back at 30km, and Gishu went ahead of Javornik after they had passed through 35km together in 2:02:48. The heavy rain and cold could not stop Tesfaye Eticha, based in Switzerland, winning for the second time. He won the inaugural edition in 2003. Eticha led through halfway, accompanied by two pacemakers, in 1:05:50. But Alphonse Yatich, a young Kenyan making his marathon debut, caught him at 28km and went ahead at 32km, while Eticha was having stomach problems. By 35km Yatich had built a lead of almost 200m, but Eticha recovered and managed to catch the tiring 23-year old in the final kilometre. In the women's race Danish favourite Annemette Jensen took an early lead and passed halfway in 1:17, but then began to slow. She later complained of cramp. Helena Tikhonova caught sight of Jensen at 35km and by 37km had drawn level. She pushed on ahead to win by nearly 400m. In the absence of the top two Swiss women, Claudia Oberlin and Vera Notz-Umberg, 26-year old Maja Neuenschwander, from Berne and running only her second marathon, was the first Swiss to finish. There were 7000 starters in this fourth edition. Australia's oldest city marathon, held in the national capital, had perfect conditions for the 30th running. It was cool (rising from 0-16°C) calm and sunny, with 59% humidity and no wind. Almost 1000 marathon runners from 13 countries participated in the marathon, with another 850 in the Asics Marathon Eve 5/10km and Kids Marathon. Over 80% of the marathon field were visitors to the national capital with the majority coming from other Australian States. Barry Keem ran his first marathon on Australian soil. After a debut of 2.25.11 in Los Angeles last year, followed by a 2.24.25 in New York City, Barry showed remarkable consistency to win in Canberra with a further 15-second improvement. His even pace allowed him to overtake defending champion and early leader Magnus Michelsson just before 41km, and he made the last kilometre look easy. At the 30km mark he had been three minutes behind. Shireen Crumpton had been overlooked for New Zealand's Commonwealth Games team after running a personal best 2.37.03 in the Helsinki World Championships. In Canberra she cruised to an easy victory, her second win here in three years. Local Emma Murray, the reigning World Long Course Mountain Running champion, made a solid debut and as first Australian female, she joined Barry Keem in winning a trip to a Japanese marathon, courtesy of race sponsor Asics. 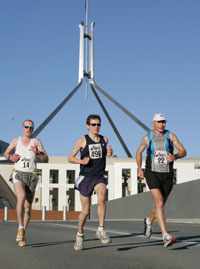 The Canberra Marathon allows an option for all finishers to continue for another 7.805km and run a 50km ultra marathon. This 'extra' has been a feature of Canberra for the past 13 years and this year the race was rewarded with the inaugural Australian 50km Road Championships being held in conjunction with the event. A record 78 runners went 'beyond the marathon' with New Zealander Mark Hutchinson, now living in Queensland, and Siri Terjesen (USA), also a Queensland resident, being the inaugural Australian 50km Road Champions, running 3:09:05 and 3:35:19 respectively. One champion won again, the other was vanquished writes Ken Nakamura. Albina Ivanova defended her title while James Macharia conceded to his compatriot Nephat Kinyanjui. In the men's race Gidey Amaha broke away after only 2km. He passed 3km in 9:40 and 5km in 15:35—not unduly fast, but he headed the 17-strong chasing pack by 200m and continued to go away. At 10km (30:41) he was nearly 400m clear as the pack consolidated behind him. He was still 150m clear at 20km (1:02:03) but after 25km he slowed - taking 16:10 to go from there to 30km. As his effort faded, three runners started their chase. Kinyanjui, Russia's Georgiy Andreyev and defending champion Isaac Macharia caught Amaha at 31km and left him trailing by 34km. At 35km Macharia was slowed by a stitch, and dropped back. Kinyanjui and Andreyev entered the stadium together, but the Kenyan had the strength to claim victory over the final lap. Masako Chiba led the women's race in the early stages (10km: 36:01) at a modest pace and was then found wanting (she dropped out at 22km) as Silvia Skvortsova took up the running. Skvortsova led a group of six through 20km on an even schedule (1:12:08) but then broke clear with the defending champion Albina Ivanova. Ivanova went ahead at 30km for an untroubled win, although behind her marathon debutante Nina Rillstone (NZL) came through to finish under 2:30, and hard on Skvortsova's heels. Basweti Momanyi patiently held back from a leading foursome in the early stages and trailed by over 100m at 10km. He was 30 seconds behind three leaders at halfway (1:04:45 to 1:05:15) and remained 12 seconds behind at 30km. He was still in fourth place at 35km but then moved through to lead by 12 seconds at 40km and inexorably extended his advantage through to the finish line. The women's race had only nine finishers. Robert Cheruiyot broke the course record by a single second (beating Cosmas Ndeti's wind-assisted 1994 mark). In the women's race Rita Jeptoo made something of a competitive breakthrough. The weather was "ideal for running", and the NW wind probably did more to assist than obstruct. There were 22517 entrants from 94 countries and all 50 states (8849 women), making it the second largest ever field assembled in Boston (after the 1996 centenary race). The elite women departed 29 minutes before the men, and Reiko Tosa made the early running, passing 5km in 17:05, 10km in 34:07 and halfway in 1:12:18. 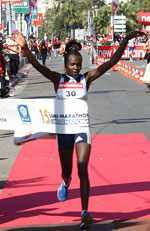 With four-time winner Catherine Ndereba not defending her title, the race was open. Tosa gradually shook off others until by 30km she had only three others for company: pre-race favourite Jelena Prokopcuka, Bruna Genovese and Rita Jeptoo. Genovese tried her luck next but to no effect. Prokopcuka took up the pace but Jeptoo tracked her closely, and Tosa fell in tow as they passed 35km in 2:00:13. Jeptoo had finished as fast as anyone in the World Championships in Helsinki last summer, and here she did the same. She stretched out with 5km to go and quickly gained nine seconds. Prokopcuka fought back, but never got closer than a six-second deficit, with 1500m to run. Jeptoo sprinted to victory in the eighth fastest time ever run by a woman in Boston. In the men's race inveterate front runner John Yuda led out (5km: 15:22; 10km: 30:04; 15km: 44:51) and thinned the group to 10 members. Then Ben Maiyo stretched them out. He eventually went clear with Merga and US hope Meb Keflezighi, passing 20km in 59:33 and halfway in 1:02:43. There they were 12 seconds up on a chasing trio of Timothy Cherigut, Robert Cheruiyot and Korir. Alan Culpepper, Wilson Onsare and William Kiplagat followed 30 seconds further behind. Maiyo went through 25km in 1:14:21, straining to go clear as he approached the Newton Hills, but obviously concerned with those behind him. Advisedly. By 30km (1:30:30) Robert Cheruiyot, the 2003 winner, was hard upon his heels. Keflezhigi was 11 seconds adrift. Cresting Heartbreak Hill at 33km, Cheruiyot started to move away to a comfortable win, while Maiyo took an isolated second and Keflezighi an assured third. Brian Sell's even pace took him past Alan Culpepper in the late stages and two more Americans made it into the top-10, for the best overall home showing in Boston since the infamous Beardsley-Salazar duel of 1982. This was unquestionably a fruit of the Hanson's Brooks project in Rochester Hills, Michigan. Kevin and Keith Hanson own a couple of running stores there, and have poured their savings and profits, as well as their passion, into an elite training camp which has helped to change the face of American men's marathoning. Japhet Kosgei put three years of indifferent performances behind him, and did exactly as he promised the day before, winning in a new course record writes Pat Butcher. The 38-year old predicted both victory and the record, taking over a minute off the previous best mark, 2:12:10. Kosgei had played the previous day's press conference like a stand-up comedian, telling the audience that his loss of form after three sub-2:08 performances and victories in Rotterdam '99, Toko '00 and Lake Biwa '03 was due to getting married, then adding after laughter, "and starting a business". "People said I was too old, but I was concentrating too much on my printing business. Now I'm concentrating on running again, business can wait 'til I retire. My body feels the same as six, seven years ago, when I was running 2.07. Now I want to keep on running, and break the world record for a 40 year old". That is 2:08:46, by Andres Espinosa of Mexico, set in Berlin '03. And the way Kosgei frisked away from his rivals in Belgrade suggests that he may well achieve it. 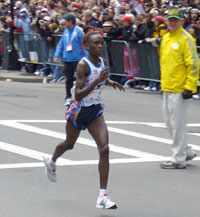 In cloudy weather, and temperatures rising from 10-15°C throughout the race, Kosgei stayed with a group of eight until 35km, before easing away to victory. "We always say that the start of the race is 35km. I wanted to know who would follow me, and no one did. Everything worked perfectly". In fact, Festus Kikumu tried to follow, but as he said afterwards, "I was not surprised that it was Kosgei who went away. After I talked to him yesterday, I knew he would win, and I knew I would be second". It was the experience of almost 20 marathons which won the women's race for Halina Karnatsevitch. At halfway, the Belorussian was 80 seconds down on relative newcomer, Chemokil Chilapong of Kenya. But Chilapong, having her first race outside Kenya, was too optimistic and was caught at 30km. Former track and field superstar Carl Lewis fired the starting signal, and presented the awards afterwards, including the Fred Lebow Trophy for both winners. Julio Rey racked up his fourth victory in this race by beating his own course record and personal best by 35 seconds writes Jorg Wenig. The women's race was the best yet, with 20-year old Robe Tola equalling Katrin Dorre-Henig's course record. Rey finally broke away from Robert Cheborbor only 2km from the finish, quickly establishing a commanding lead despite finishing with stomach problems. Tola won by a much bigger margin. Edith Masai had led out in the first half, but despite her fast half marathon run in Berlin three weeks before, she was unable to stretch this over the full distance. There were over 16,400 runners: 13,250 men and 3,175 women. 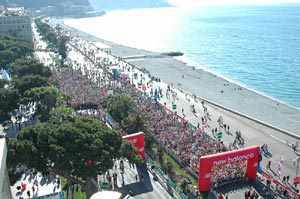 Runners basked in the sun during the 15th edition of the International Nice Half Marathon, as it took off from the famous Promenade des Anglais. Some of them had victory in mind, others only the desire to be part of this great sporting event. Everything fell into place: on-course entertainment, crowds flocking to see the spectacle, and a lot of emotion and fun. Along the route on race day and and during the three days over which this event spreads itself 35,000 active participants benefitted from all the various entertainments on offer: pasta party, treasure hunt, and a great raffle. These, and the race itself, were all spiced up by enthusiastic music groups to make this event one big party. Enthusiastic onlookers urged on the leading men, where an exciting contest developed for the top-three podium places. The leading Frenchman, James Theury gave a creditable performance in 4th place. In the women's race there was a fierce struggle: at first the Kenyan women led the race far ahead of the home favourite Christelle Daunay, who nevertheless took a creditable third place. In all, a good day was had by all. There were many fast performances and massive participation of both spectators and runners in the three races. Other than the Half Marathon there were also 10km and 3km events. 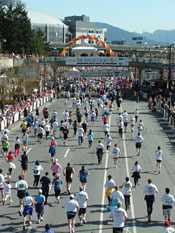 For the first time in its 22-year history, the Vancouver Sun Run had over fifty thousand entrants, writes Teresa Nightingale. A system of wave starts kept the crowding to a reasonable level, with the last group setting off long after the leaders had finished. The weather was picture-perfect with clear blue skies and no wind, a cool spring morning that warmed as the race progressed. There was a moment of confusion followed by laughter at the start line as Gilbert Okari started to run upon hearing the words "on your marks", about 1 second before the gun went off. Immediately realizing what happened, Okari put on the brakes and the rest quickly caught up to him — but not for long. Meschack Sang managed to stay with him for only 3km, after which Okari gradually built up a 1 minute lead. Kang finished second, followed by top Canadian Joel Bourgeois. Isabella Ochichi, 2004 Olympic silver medallist at 5000m, broke the women's course record by 10 seconds, held since 1996 by Canada's Angela Chalmers. Ochichi tried to go out with the men but ended up running on her own for most of the course. Her 30:55 put her 12th overall. Tatyana Hladyr, coming off a win at the Rome Marathon last month, was over a minute back in second place. In total, 50,746 participants were registered, including more than two thousand parents and children in the 2.5km 'Mini Sun Run'. There were over 1427 runners: 1294 men and 133 women. A bright but cool morning greeted 13,000 entrants in the 29th edition of this race in the Spanish capital. Major reconstruction in the city has enforced significant course changes but the start took off as usual from the Biblioteca Nacional. From here runners faced a slow climb throughout the first 5km north towards the twin leaning towers in the distance at the Plaza de la Castellana. The modest but noticeable altitude also tests the pace of both leaders and fun runners. A group of 15 men got away early, with Alberto Juzdado pacing. They kept together also on the downhill section from 6km to 15km and even the long switchback climb from there to halfway failed to thin the group out very much. In the women's race the early pace was shared by the top six runners, but it took only until 15km for them to separate themselves. Banuelia Katesigwa (formerly Mrashani) of Tanzania forced the pace slightly on the testing section of the course before halfway, and passed through there in 1:16:20, 20 seconds up on previous winner Florence Barsosio, who in turn led Beatrice Omwanza by another 48 seconds. Although Katesigwa looked tired towards the end of the long loop through the western side of the city, she did not slow her pace much, reaching the finish in the Parque de Retiro 80 seconds ahead of Barsosio. The men's lead group was still holding together through 26km (1:21:20) but by 30km Silas Sang had started to pull ahead, taking both James Moiben and former Berlin winner Joseph Ngolepus with him. These three then had a race all to themselves, as the minor placings changed dramatically behind them over the final kilometres. It was Ngolepus, tracking the other two, who launched his attack towards 40km. For a while he led Sang by an indecisive few seconds, but entering Retiro Park he strode out to a convincing victory and a new event record. Both Sang and Moiben also broke the old mark of 2:12:24. To mark the 11th anniversary of the Oklahoma City bombing over 1700 people ran in the marathon and nearly 2600 in the half; twice as many men as women over the full distance, but women were in the majority in the half. Jerry Faulkner strode away to win by a big margin. Only Russell Sears kept him company to the 10km point. He later paid for his early efforts, slipping back to fifth place. Just short of three thousand runners participated in the 21st presentation of this scenic classic "on the edge of the western world": 1824 men and 1123 women.